Today’s post is near and dear to my heart. It is about food. I love food and love food that is able to be stored for long periods of time, be easily transported, takes no real preparation before consuming, and ACTUALLY TASTES GOOD. Enter the Bridgford Read to Eat Sandwich. This sandwich package was about $6 for two wrapped breakfast creations. There are tons of different varieties, but this was what we tried first. I figured that anyone who could make a French toast sandwich in a shelf stable form that tasted decent was on to something. Now I have eaten MORE than my fair share of MRE’s while in the military. Many were barely edible, but some were pretty good. The most current batches are actually downright tasty. If Bridgford is able to tap into any of that tastiness for their product, these things might be a winner….. Now for the opening and testing. This is how the sandwiches are packaged. Two of these tan wrapped sandwiches come in each plastic bag. 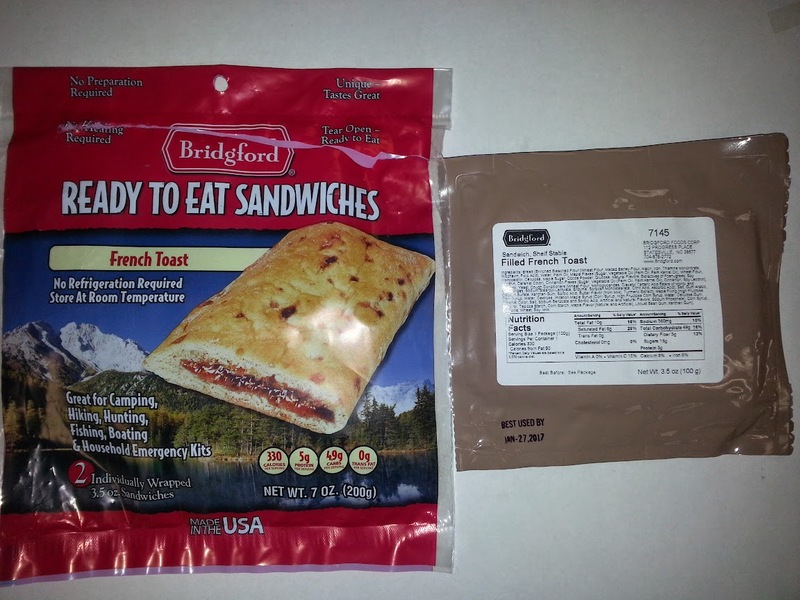 The actual sandwich look very reminiscent of the old MRE maple nut cakes. It also had that same smell, which definitely brought back memories. Here is what the look like with the wrapper pulled back. 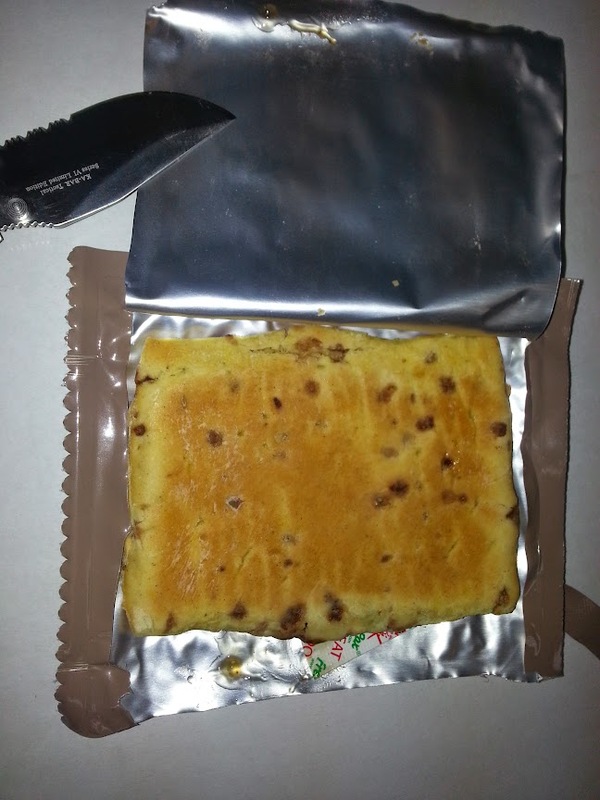 The taste was also very similar to the MRE maple nut cakes, but a bit more sweet due to the syrup. All in all, they were not that horrible. As a primary source of food on a daily basis you could not run fast enough to get me to eat one every morning. As an occasional meal while out in the woods or in a SHTF type situation, you bet I will be back in line for seconds. On my “Tastiness Scale” I would give it about a 6/10. As a matter of reference I consider my tuna casserole 1/10 and my prime rib a 10/10. This fits in around the BBQ chicken area of the chart. I am actually looking forward to trying out several more variations of these sandwiches. If they can make the French toast into a shelf stable variant that tastes this good, their Italian and BBQ versions must be incredible. 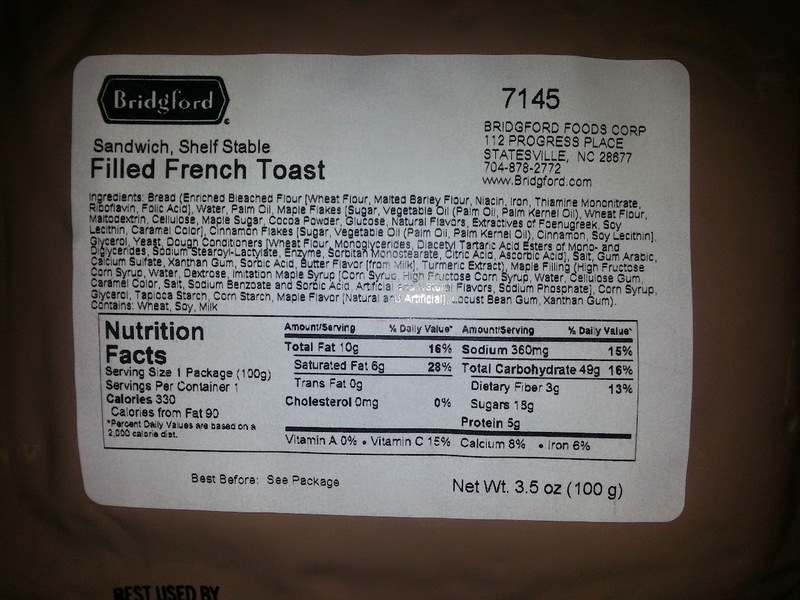 This entry was posted in Emergency Preps, Miscellaneous and tagged Bridgford, emergency food, French toast, MRE sandwiches, packing food, ready to eat, shelf stable food on September 2, 2014 by Woodsbum.